“It’s like he was shooting a deer in the woods,” Mr. Scott told the Today show when describing his son’s murder by a police officer Saturday. Walter Scott was pulled over by Michael Slager for a broken brake light. Somehow a normal traffic stop turned into a scuffle, leading Scott to sprint away. Unfortunately the father of four didn’t get far before Slager blasts eight bullets in his back. 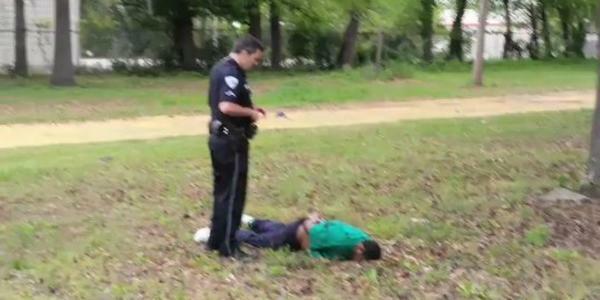 As he lay facedown on the grass, Slager handcuffs him, checks his pulse, but never calls for help. The officer used the I-feared-for-my-life excuse, and claims Scott took his taser. Nope. But cellphone video shows Slager picking up something (taser?) and dropping it by Scott’s lifeless body. Soon after the South Carolina cop is arrested and charged with murder. Question: Would the Scott family get this swift justice without the tape? Hell to the no. It didn’t work for Eric Garner or Ramarley Grant whose shooter (also in blue) is officially scot free. As depraved as it sounds, maybe it’s like a numbers game, eventually, out of all the frequent encounters of Black lives lost from Ferguson, Missouri to Staten Island, New York, the odds are finally in our favor. It was bound to happen before the scales of justice tipped too far to the wrong side. However, it feels like, looks like and sounds like the new normal is they shoot, and so do we.